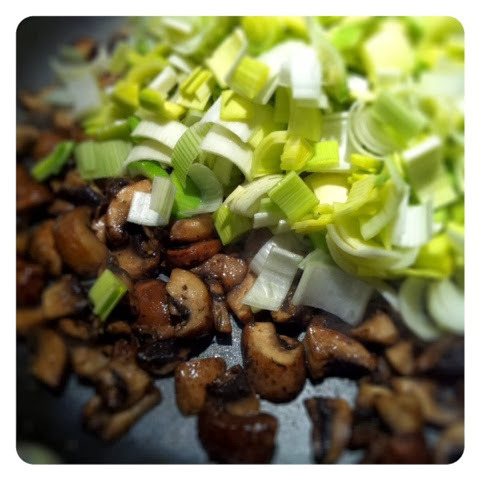 Who'd of thunk a college kid would like mushrooms and leek in a dish? Well, lucky us, our son does. 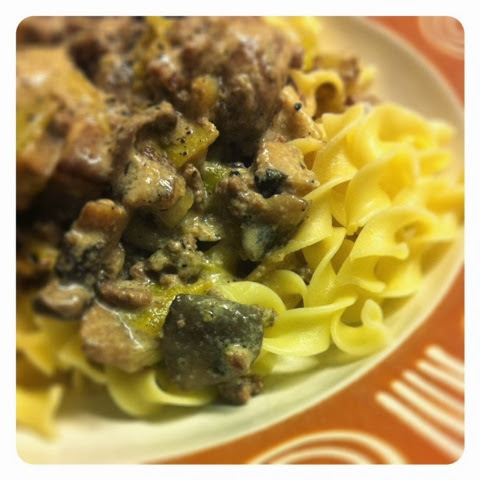 This recipe is originally from Germany where I grew up--sort of a poor man's version of beef stroganoff. The first time I made it at home, the leftovers were gone by breakfast thanks to Jon. 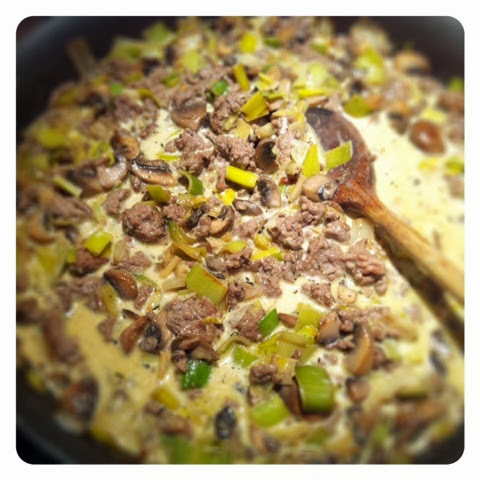 This isn't your typical college kid's fare, but Jon has requested that I post this recipe so that when (and if) he ever begins cooking, he will have it waiting online! 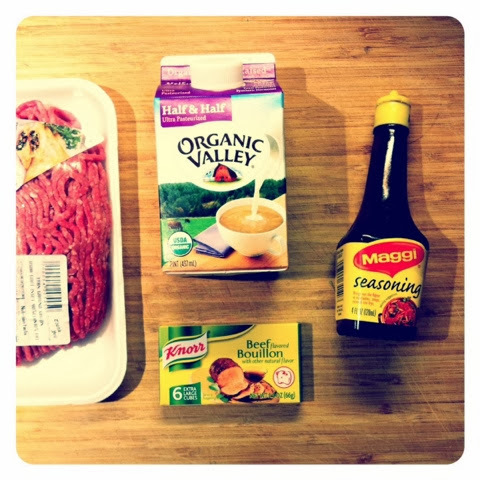 After making the Pasta Bolognese, an Italian meat sauce, try this one which is a little more savory, earthy, and rustic in character. 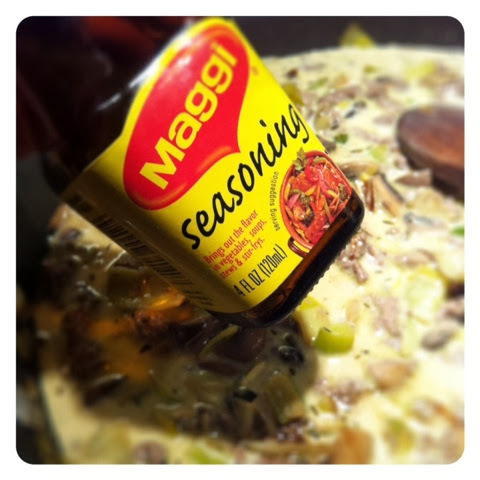 The key ingredient is using Knorr's Maggi Seasoning, easily found in the spice aisle or international section. If you don't have it, don't skip trying the recipe--just get a bottle the next time you are at the store. 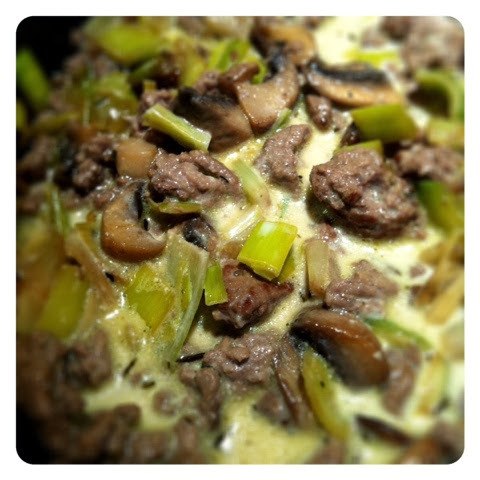 I have reduced the fat by replacing 2 cups of heavy cream with milk / half-and-half, and by using ground sirloin. 2. Prepare all your veggies before heating things up. 3. Heat the olive oil and butter in the large non-stick skillet under MEDIUM-HIGH heat. 4. 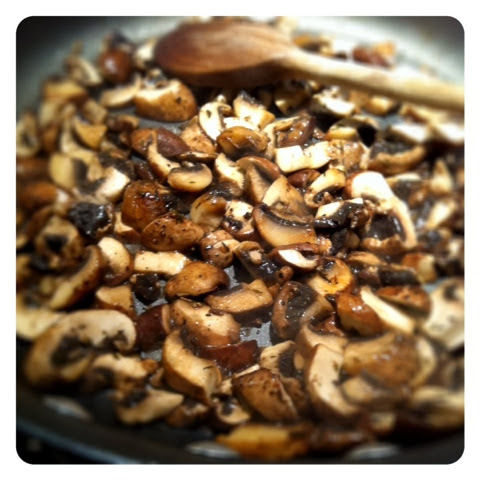 Add your mushrooms and turn heat to MEDIUM. 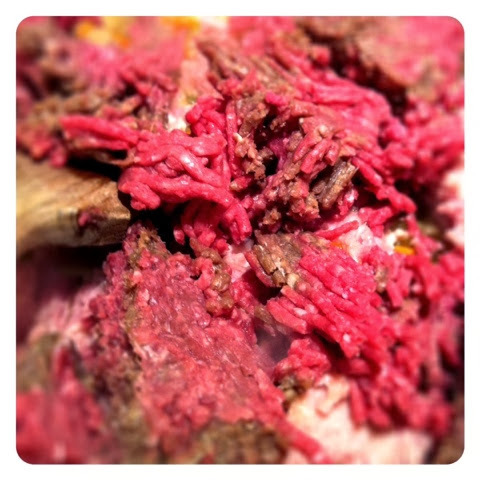 Cook until beginning to brown. 5. 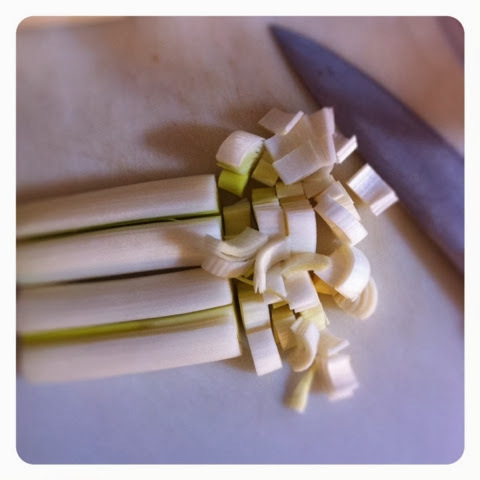 Add your leeks. 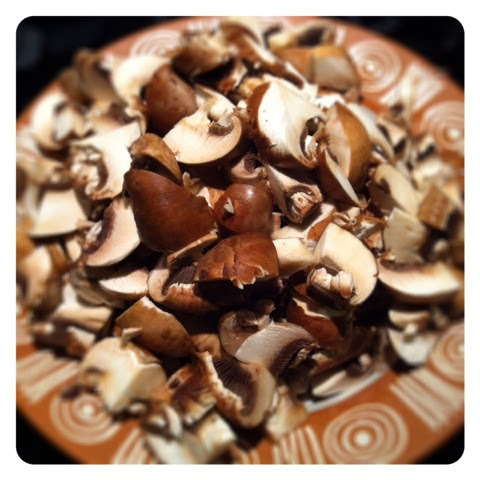 Cook until softened and slightly translucent. 6. Remove from skillet and set aside. 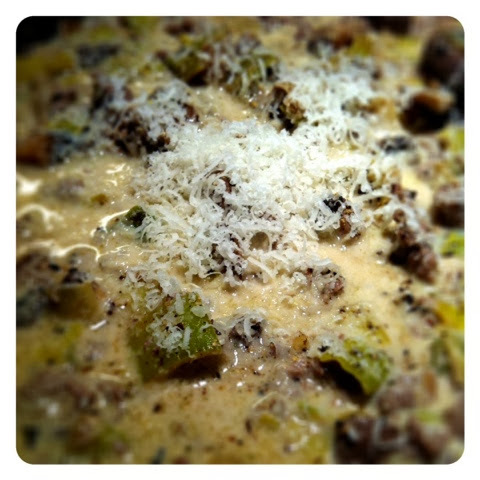 Or, add the meat into the vegetables, and cook stirring frequently. 7. 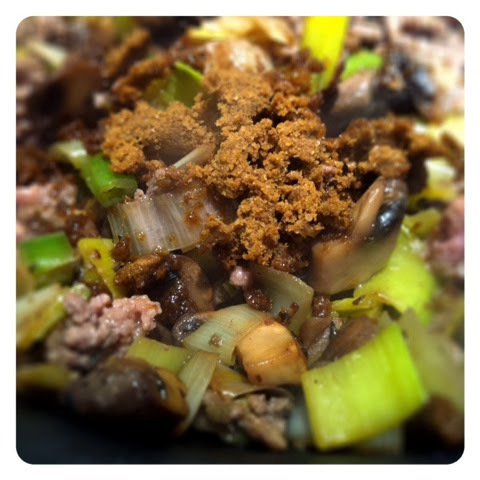 Once the meat is browned, sprinkle the DRY bouillon cubes over meat mixture. 8. Add 1 cup milk and 1 cup half & half. Stir frequently and then let SIMMER on LOW heat. 9. 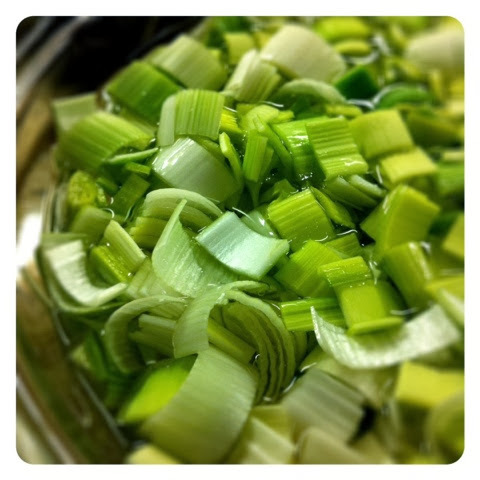 Sauce should begin to thicken over 8-10 minutes. Season to taste. If thickens too much, add milk. 10. Add 3-4 dashes of Maggi Seasoning and 1/3 cup of parmesan. 11. 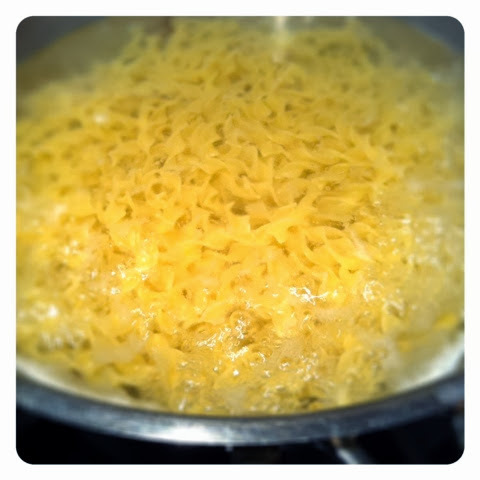 While the sauce is thickening, boil your pasta, preferably egg noodles. 12. If you don't have egg noodles, any other pasta will do!